With the internet being as popular as it is, advertisers are looking to get their ads in places that people often frequent. After all, the more people that view their ad, the higher the chances the company will sell their services or products. That being said, Adwords has rules that they uphold and stick to in order to ensure that their advertisers are all legitimate and by the book. No one wants fake or iffy ads. 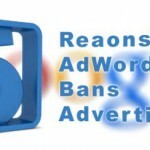 Here are the top five reasons that advertisers will be banned from Adwords. If an advertiser has an ad that is misleading (promising a free product or an impossibly low price for something), the advertising company will quickly find that their ads have been pulled from their spots. A customer is looking for a genuine experience through Adwords, so there is no point in posting an ad that is purely to get more clicks and not to deliver a fake product. You must follow the rules on the ads. Misleading ads are also dangerous on a legal side, too. Similar to the first point, this is a serious legal issue. If you have an ad that is pointing towards some sort of name brand like the examples listed, it is a serious offence. Unless you are actually offering a product or service connected to the company, using those kind of keywords is not allowed and will cause your ads to be pulled. This is a specific and tricky kind of misleading similar to “false advertisement”. Having targeted keywords is one thing, but make sure that they are directly related to your product or service, otherwise they’ll be taken off. This may not seem like a big deal, but the quality of the ad website has a lot to do with how professional it is. Those companies that are just looking to make some money won’t put a lot of time or money into creating a user-friendly website. So, a low quality website is an indication on how professional company is (if it’s legit, etc) and it’s also meant to make sure that users have a good experience when checking out the link and scanning through the website. Ads that lead to poor websites will get pulled until a better one can be provided. This is a huge no-no. If you are a company that is offering knock offs (secretly or otherwise) don’t do it through Adwords. This is a professional listing websites and they expect that everyone offering ads on that website is legit and offering good, reputable services and goods. This is just common sense. Make sure you pay the invoice on time, otherwise your rights and privileges to use Adwords will disappear. This is just bad business sense and is a indication that you are in the wrong field. Adwords does not tolerate lay invoices.